For those who pray the Liturgy of the Hours, and more specifically the Office of Readings, you may recognize this as an excerpt from the second reading for Thursday of the First Week of Lent. Two things struck me as I reflected on Asterius’ writing. First, St. Asterius revealed the connection between the liturgical seasons of Advent and Lent. In our current liturgical year, Year C, recall the first Sunday of Advent was Jesus’ admonition, “beware that your hearts do not become drowsy.” The Second Sunday of Advent presented for our consideration John the Baptist’s baptism of repentance and proclamation to prepare the way of the Lord. Generally speaking, a common theme for Advent is preparedness or readiness. A person can be prepared by always being watchful and alert, but also by repenting and doing acts of penance. This theme of repentance becomes dominant in the celebration of the Season of Lent. Today we celebrate the Third Sunday of Lent. There are two options for the readings, the first the story of the Samaritan woman at the well. If parishes do not proclaim this gospel, the people will hear assigned for Year C, Luke 13:1-9. Jesus in the gospel gives another strong admonition: “I tell you, if you do not repent, you will all perish as they did.” Jesus, however, did not leave us perished. He gave a glimpse of hope by telling the parable of a person searching for fruit on a fig tree and the gardener’s plea. The owner of the fig tree desired to cut down the tree but the gardener bargained for one more year, so that the ground may be cultivated and fertilized, and just maybe, the tree would bear fruit. Here, I find the second connection with St. Asterius. Brise in Champion, Wisconsin. Adele was instructed to pray for the conversion of sinners, offer her Holy Communion for that intention, and then catechize the young people. 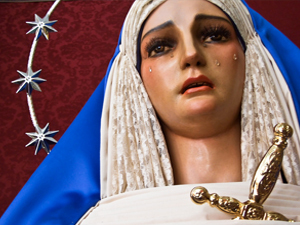 Similarly when Our Lady appeared in Fatima, she again expressed the need for repentance and penance. All throughout history in Mary’s many apparitions she has continued the same message of the Old Testaments prophets, of John the Baptist, and Jesus, who then entrusted it to his disciples. St. Asterius stated “Those who had been God’s enemies became his friends, those estranged from him became his sons, those who did not know him came to worship and love him.” How often has this been the case at the places where Mary has appeared, that the skeptic or hardened sinner experiences a conversion of heart and amends his or her life? Mary assists in her Son’s apostolic mission of bringing God’s wayward children home especially by seeking forgiveness in the Sacrament of Penance and nourishment in the Eucharist. Mary is our constant intercessor in Heaven. She is the gardener in the gospel who bargained for another year. She tells her Son, give them one more year, and maybe they will finally get it. Maybe they will turn away from sin and grow in their fidelity toward God. Maybe in just one more year, they will return to the sacraments. Give them one more year and maybe, just maybe, those who have been estranged from God will become His children, and they will worship and love Him with all their heart. No matter the liturgical season, be it Advent, Christmas, Ordinary Time, Lent, or Easter, Jesus is continually calling us to conversion of life. And over time, He has sent us His mother, to gently remind us of that message. All we must do now is listen and respond. Reading it I am reminded of the first message of Jesus in St Mark’s Gospel “The time is fulfilled, and the kingdom of God has come near; repent, and believe in the good news.” (Mar 1:15 NRS). “Repent and believe in the Gospel” is key for us all. In fact on Ash Wednesday I prefer to hear when ashes are distributed these words rather than “Remember Man you are but dust and unto dust you will return”, which is untrue. One more year. This applies to me and to my parish which is bearing little fruit in that few are responding to the RCIA despite a pastor with a good pastoral heart. May God soon renew us starting with me. Many of our parishes suffer the same lack of response on the part of the parishioners. The Holy Spirit is lacking in these parishes, today. Consider having “Life in the Spirit Seminars” welcoming the Holy Spirit into the hearts of the parishioners,,Many generations have missed this teaching…They don’t know the power of the Holy Spirit,,The Holy Spirit is the Enlightener Who guides us, strengthens us, consoles us and Who EMPOWERS US TO DO OUR FATHER’S WILL. We need the Holy Spirit, our Helper. Every parish must invite the outpouring of the Holy Spirit to renew the church in the United States of America and the rest of the world. The Holy Spirit will help the church.